Rockstar Games has shared the first details and screenshots for Gunrunning, a massive new update headed to GTA Online next month. As with earlier updates, this one will of course focus on criminal activity. In Gunrunning, Southern San Andreas’ illegal weapons trafficking industry will rise to the surface, providing new takeover opportunities for the VIPs, CEOs and Biker bosses of Los Santos and Blaine County. Rockstar says sprawling underground properties ready to be stocked with military-grade vehicles and weapons manufacturing equipment will be available via the Maze Bank Foreclosure site. Those that choose to invest in this new opportunity should expect plenty of shady customers that are prepared to pay top dollar for highly sought after offensive and defensive weapons technologies, we’re told. Rockstar revealed earlier this week that it has now sold more than 80 million copies of Grand Theft Auto V since its September 2013 launch. 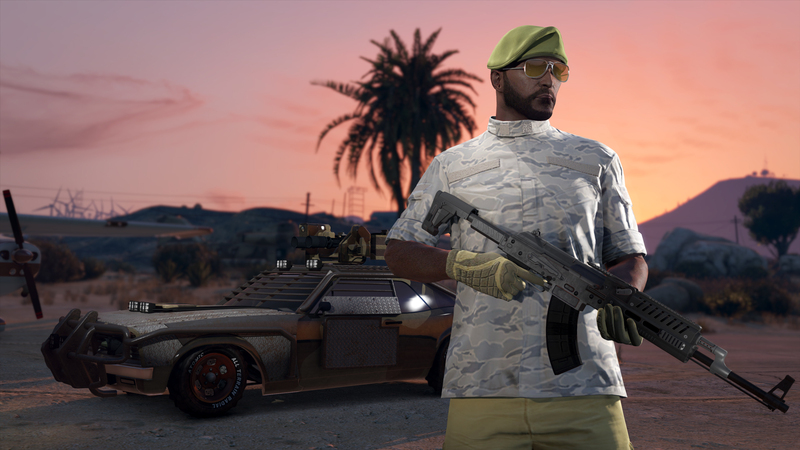 The Gunrunning announcement post was accompanied by several screenshots showcasing, for example, a weaponized upgrade for the Tampa vehicle, a private underground gun range and an APC that’s at home both on land and in the water. Rockstar promises to share more information on the update including specific business and research opportunities as well as details on the tactical, full-service Mobile Operation Centers, new weapon upgrades and customizations, weaponized vehicles and more in the near future.